Cash payments to the poor, while well-intentioned, often prove costly, inconvenient and risky for both senders and recipients – stifling financial inclusion and economic growth. The recently launched Better Than Cash (BTC) Alliance aims to reduce these inefficiencies and inspire innovation in financial services by promoting a shift to electronic payments throughout the international community. 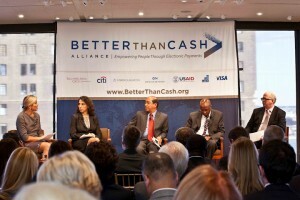 Founded by a coalition of international heavy-hitters, from the US Agency for International Development (USAID) and the United Nations to Visa and the Omidyar Network, the BTC Alliance promotes the adoption of alternative payment systems among governments, development organizations and private sector actors worldwide, many of which still primarily rely on cash for the disbursement of salaries, pensions, emergency relief, and social welfare stipends, among other transactions. To facilitate the this leap forward, the founding members have pledged to provide policy leadership, technical assistance and funding opportunities for those that commit to transitioning a substantial amount of their cash transactions to electronic systems. Already, the Governments of Peru, Kenya, Colombia, and the Philippines, along with a number of non-governmental organizations, have signed on to the terms of the BTC Alliance. Peru, specifically, has included a pledge to shift towards e-payments as part of their national financial inclusion strategy. By reducing the friction involved in transacting and serving the poor, this Alliance may “unleash a new generation of innovation and bring financial services to the poor and underbanked in creative ways,” said Arjuna Costa, Director of Investments for Omidyar Network during the launch. Over the course of the five-year initiative, Costa said he hopes this infusion of electronic liquidity and financial innovation will bring meaningful change in financial inclusion and, ultimately, equitable economic growth over the long term. However, while the BTC Alliance presents a promising step towards greater financial inclusion, the initiative will only have a long-term, global impact if more governments and organizations sign on to the terms – reaching a critical mass of members. This will require, according to Costa, creating a compelling body of knowledge and enough success stories to build momentum behind the transition. Committing governments and organizations will also need to overcome challenges to implementation, including those highlighted in the above article: infrastructure limitations, lack of government coordination, and insufficient communication with the intended beneficiaries.